Wine Tasting Cellars – Should they charge? For most people, the best part of any wine tour is visiting the cellars and tasting the wines, but the experience in Europe is often quite different from that of visiting New World wine regions. The main reason is that most European wineries are small family-owned estates many of whom lack proper facilities for receiving visitors. In the New World, where the average winery size is much larger, tasting rooms are the norm for most and the facilities offered are much greater. Also, if you travel in California wine regions, it’s almost standard practice to pay for tastings; in Europe, this remains the exception rather than the rule. Last month at the European Wine Bloggers Conference in Lisbon, sponsored by Wines of Portugal along with a host of others, I was part of a panel debating Wine Tourism and Social Media. Much of the debate was taken up with how wine travel in the New World and the Old World differ. Our panel was moderated by American Amy Lillard who owns the small southern France wine producer La Gramière, and she voiced that wine bloggers (and I would add travel bloggers) need to make sure their readers appreciate these differences. Wine tourism has been raised to a fine art or perhaps you could say an industry in New World wine regions, led by California and South Africa. Tasting rooms, shops, a range of options for vineyard and winery tours, picnic areas and children’s facilities may be just some of the offerings, usually at a price. In the Old World, if the wine producer has time to be there and you can communicate sufficiently in each others’ language, you might have the experience of a lifetime with a personal tasting and tour all at no charge. But arguably, there’s a hidden cost. Amy pointed out rightly that small family wineries are often too busy in the winery or the vineyards, or even delivering wines to customers, to be able to look after someone who is simply visiting for the experience of tasting wines in their place of production. You may not have to pay for tasting in the Old World but there might be no dedicated tasting room staff or tasting room, and the producers might simply not have time to receive you. It’s a dilemma that we at Wine Travel Guides try to address by recommending on our guides only producers who welcome independent wine travellers; in most cases we suggest that you make an advance appointment to visit. Europe is beginning to change slowly as it starts to embrace wine tourism more fully, but many wine producers still believe that the reason for welcoming wine tourists is to sell wine. Anthony Swift of Wine Pleasures, who organises wine tourism events and group tours in Spain, asserts that producers should learn to separate completely the idea of welcoming tourists for a visit from the act of selling wine, and he tries to encourage wineries where he brings groups to accept payment. My brother is in aviation, has may planes, we’ve been fortunate to travel by small plane to these great vineyards. I totally agree and know that for the independent wine tourist, travelling home by plane, it’s obvious they cannot buy wine at the time, though it’s true if they are given an easy contact to follow up they may well source the same wine they tasted when they get back home. It’s only recently that wine producers in Europe have started to look at the wider picture of wine tourism and to treat it as a good public relations activity for not only their own winery, but for their wine region too. Nevertheless, the facilities needed to welcome visitors properly cost money and even more, so does the time for someone to host visitors, and not all producers have this money available. Sunday openings are rare in Europe as family-owned producers use this day to catch up with paperwork and things at home including spending precious time with the next generation of wine producers. To pay for someone to look after the tasting room on a Sunday would also be considerable. In many New World wine regions, especially California, and in a few in Europe, notably Champagne and more recently Bordeaux, it’s become normal to pay to taste the wines. In some of these wineries, there is a sensible policy that if you buy wine at the winery tasting room/shop (and in Europe this isn’t always possible at high-end wineries), they will refund the tasting fee. On the other hand, traditional wine producers in Europe are worried that they will put off visitors who might be potential buyers, as they have never before levied a charge, so they are still reluctant to do so. In my view, by paying for a tasting, a wine tourist helps contribute to the wine producer’s time, the cost of the facilities and the wines tasted. And, as long as there’s no dumbing down of the welcome and someone who really knows the wines and the winery is there to taste with you and show you around, then a small charge with longer opening hours can only be a good thing for both wine producers and wine tourists. So, over to you, do you think European family-owned wineries should charge for tasting? And if so, how much on average? Please visit our Facebook page and participate in the poll (you need to become a fan first), and if you have any comments, I would welcome them here. We have more than 500 recommended European wine producers on Wine Travel Guides who are ready to receive visitors, though many insist on advance appointments. Few currently charge. You can cruise around the site to find them when planning your next wine tour and we provide their visiting hours. To have full access to print the PDF guides you need to join as a Gold Member, and Membership makes an ideal Gift for a wine lover planning a trip to Europe in 2010. Thanks for reading over the past year and I wish you a fine finish to 2009 and happy planning of your Wine Travels for 2010! 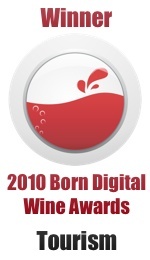 This entry was posted on Wednesday, December 23rd, 2009 at 7:14 pm and is filed under Wine Tourism General. You can follow any responses to this entry through the RSS 2.0 feed. Both comments and pings are currently closed. One Response to Wine Tasting Cellars – Should they charge? Just to note that there is also an animated discussion going on in the Wine Connections group in LinkedIn.